Gin & Cream Rooibos Tea is a one of a kind blend. With a dry front flavor and ending on a creamy note, this blend is great hot or cold. 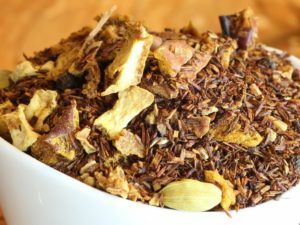 Gin & Cream Rooibos Tea is a one of a kind blend. With a dry front flavor and ending on a creamy, vanilla note, this blend is great hot or cold. Juniper berries, lavender and vanilla intermingle to give this rooibos blend its unique aroma and taste. With South African rooibos, juniper berries, lavender, marigold flowers, cardamom, and vanilla flavor.